KEEP YOUR LARGE AND HEAVY BOOKS ORGANIZED – Is your collection of Harry Potter, Lord of the Rings, or Outlander series piled up somewhere on a shelf or under your desk? Large heavy books will get ruined if they are not stored correctly. These metal bookends are sturdy enough to hold even the longest of books with thousands of pages. MAKE YOUR HOME OR OFFICE LOOK SMART – People who have lots of books around their home definitely seem smarter than most! Create a scholarly feel in your home & office by using the mesh screen bookends on your coffee table, desk or open shelf space! With lots of books surrounding you, you can always curl up with a book and learn something new every day. VERSATILE USE WHEREVER YOU WANT – Perhaps you don’t own a bookshelf and you just want to use these as a desk organizer. You are free to use the mesh bookends on a bookcase, on your shelf, nightstand, vanity or desk. Organize your life as you please. Journals, magazines, college books, children’s books and more can all be stored neatly using the black economy bookends. MODERN DESIGN – The mesh book holders are not only stylish but are super practical too. Keep books on your desk for easier reference with these steel mesh bookends. The steel rims and angled bases offer a professional look and keep your books upright and ready to use. No more rummaging through piles of books or papers. YBM HOME OFFERS UNPARALLELED HIGH QUALITY - Unlike plastic bookends or flimsy thin metal, these are made with sturdy steel. 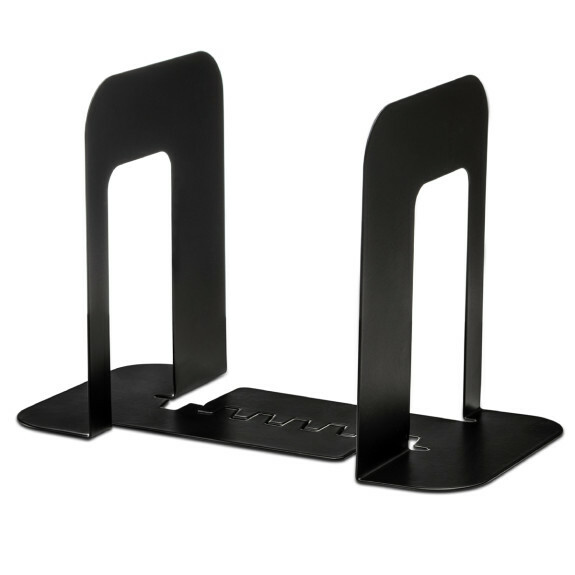 The pair of bookends is powder coated with a matte black finish and offers a minimalist look for your space. It’s time to add some style, efficiency, and productivity to your home or office! Measurements: Length: 9 in. could go up to 12 in. Width 5 in. Height 6.25 in. It’s Time to Let your Books, Magazines, & Journals Stand Upright, Ready to Read - Cluttered Free! Keep your Home or Office Clutter Free! If you are a bookworm or magazine addict then you know all about piles of magazines, and books cluttering up every corner of your home! It’s time to get organized with our mesh metal bookends. They can be used for the largest, most eclectic book collections or for decorative purposes on your desk or mantlepiece. ✔️ Holds Large Books – These extra strong sturdy metal bookends are ideal for even the heaviest of books. They won’t bend or break like other cheaper versions! ✔️ Sturdy Design - The steel rims and angled bases offer a strong structure, that keeps your books upright and ready to use. ✔️ Mesh Design – The plain black steel design adds a minimalist, modern style to your home or office. Not too plain and not too fancy just right. ✔️ Black Powder Coating - The pair of bookends is powder coated with a matte black finish. It is very high quality and wont scratch off. ✔️Get Smart & Organized – With books all around your house, bedroom or apartment, you are sure to get smarter every day! But make sure they are organized and ready to read with these metal books ends. ✔️ Value Pack of 2 – This pair of book ends can be used facing both inwards and outwards. Use inwards for very heavy books as they can sit on the base and provide extra support. These book holders can be used anywhere! Use in your classroom to organize the teachers desk, or in the teachers room to store important books, papers or files neatly. Amazing desk organizer for an office desk, coffee table, book shelf, or even for the kitchen to hold all the cookbooks!